The app contains trivia questions based on the popular Who Was...? series of educational children's books. Penguin Young Readers has announced the release of its latest educational trivia app, Who Was? Adventure, based on the Who Was…? series of books from Grosset & Dunlap. Who Was? 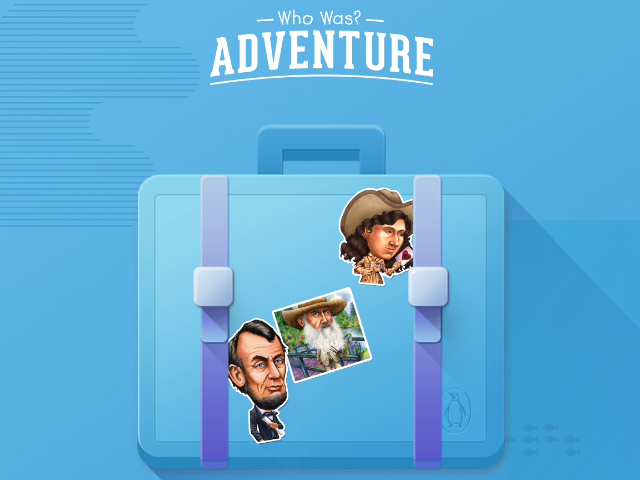 Adventure features over 4,500 trivia questions for both young players and adults, challenging their knowledge of famous historical figures. The game’s questions have been developed using content from the books, and are arranged in 85 levels in an adventure mode. During each game, players must answer questions about figures past and present, ranging from King Tut and Julius Caesar to George Lucas and Abraham Lincoln. Players are presented with statements about these famous faces, and must tap on the appropriate person as their pictures fall from the top of the screen. Players are shown the name of each individual for the first few seconds they’re on screen, so they aren’t required to identify figures by their faces only. While each level has one historical figure as its base, the majority of questions vary greatly in theme and in their position on the overall historical timeline. At the start of each level, players are presented with a few appropriate facts and a timeline from the Who Was…? books to help them play. As players answer questions, they earn power-ups. A bullseye, for instance, can instantly answer a question correctly. Outside of adventure mode, a separate arcade mode allows gamers to challenge others in endless trivia battles. Here, users work to beat their friends’ high scores. An achievements system rounds out the game, as users are given rewards for completing specific tasks, like answering every question correctly in a single round, for example. As a premium game, the title doesn’t offer in-app purchases or ads. Who Was? Adventure is available to download for $1.99 on the iTunes App Store.